The best way to illustrate the extent of the challenges faced by a hospital such as UZ Brussel is to present some specific figures. In 2015, the hospital had 16,350 admissions through the main entrance, 13,927 admissions through the emergency department and 25,100 day-care admissions. All these patients rely on the dedicated care of 3,500 enthusiastic employees. "Literally thousands of patients and staff must be able to make calls from and to the hospital quickly every day", says Eric Pattyn, the System Administration Manager of the university hospital. UZ Brussel processes more than 110,000 incoming calls and more than 50,000 outgoing calls each month. "The patients’ first contact with us is often by phone – when they call to make an appointment with a doctor, for example", Eric Pattyn explains. "Phone calls are also made in case of emergencies or when patients’ families or friends want to show their support. Each of these calls is important. It is our job to ensure that not a single call is missed due to a network overload or defective line. That is why we chose Orange. We know that they have the right expertise and capacity to handle all our telephone traffic effectively." Eric Pattyn explains Orange’s solution lies in a redundant system: "Our phone exchange has eight Primary Rate Access (PRA) lines or landlines. These landlines are set up in such a way that they cannot all break down at the same time. On one side of the premises, we have four PRA lines over copper wires and on the other side, we have another four PRA lines over fibre cables. If the copper connection is damaged because of digging work for example, we can still make and receive phone calls. In such cases the fibre optic PRA lines can handle all calls. The four copper PRA lines lead to one AudioCodes gateway and the four fibre optic ones lead to another AudioCodes gateway. Even if one of these gateways malfunctions, the telephone calls will be diverted to the other gateway. Each gateway then leads to an individual Private Automatic Branch Exchange (PABX)." "Although our patient portal will soon allow patients to make their appointments online, most communication to and from the hospital still happens by phone", Eric Pattyn emphasises. "That is why we continue to rely on the Orange network and solutions. We are now doing tests with SIP trunks instead of PRA lines for our Skype for Business environment. 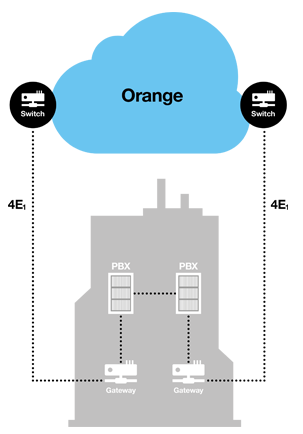 By using the Orange IP VPN network for our telephone traffic, we are making our infrastructure future-proof and ready for new applications, such as unified communications." Are you interested in the same solution as this client? At UZ Brussel, patients always come first. 3,500 dedicated employees make every effort to offer a total package of accredited health services of the highest quality.